Kelp, a type of brown seaweed, can form dense ‘forests’ along the coastlines of temperate countries. 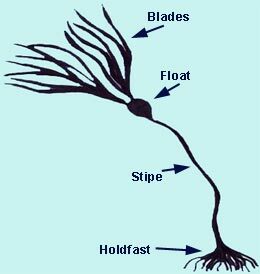 As long as there are rocks available for the kelp to attach to with their ‘holdfasts’, then it can flourish. Kelp forests are a key component of temperate marine ecosystems contributing to ecosystem production, biodiversity and functioning. The dense forests of kelp can create a habitat providing food and shelter for a variety of marine species. These species include marine mammals, seabirds, fish and invertebrates. Kelp are primary producers and kelp forests can produce high amounts of oxygen. They can also contribute to carbon sequestration (removal of carbon from the atmosphere). Large amounts of carbon is stored within the living kelp, which can then be transported to depth by dying kelp. In some countries, such as France, kelp is also commercially harvested for the agriculture industry and the production of alginic acid. Throughout Europe the status of kelp forests and the general trends and drivers are relatively poorly studied on a country-wide or European-wide scale. A collaborative paper by Araújo et al in 2016, aimed to bring together this information to study long-term trends and identify areas in which research needs to focus. Overall, the study found that native kelp forests were declining throughout Europe, particularly in the southern regions of Europe. On a local scale the condition of native kelp forests varied, with some areas and/or kelp species declining, remaining stable or increasing depending on local factors. These local factors ranged from the simple (trawling of the seabed physically ripping up individuals) to the complex (cascade effects). For example, kelp forests in Norway have suffered great declines in the past. The initial decline in kelp forests was triggered by overfishing which lead to a reduced predator pressure on sea urchins. The sea urchin populations then increased along the Norway coast, and as sea urchins enjoy munching on kelp, the destruction of kelp forests increased. However, in recent years warming sea water temperatures have been unfavourable for reproduction in sea urchins, thus causing a reduction in the populations along the coast. This in turn has allowed the recovery of kelp forests along some parts of the Norway coast. Although the outlook for kelp forests is not ideal at the moment, the authors recognised that there is an opportunity for marine conservation to help protect these important habitats and at least reduce many of the local factors (pollution, overfishing, sedimentation, harvesting) that are causing reductions in kelp forests and thus would make them more resilient to less easily controlled factors (climate change).